John Blachford was born about 1598 in Dorset, England. He married Mary Renaud of Devon. 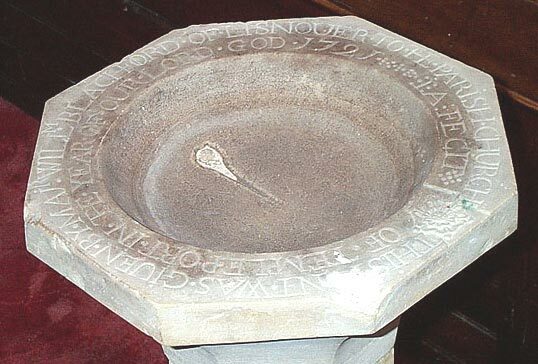 They had six children - John, Ambrose, Thomas, Mary, William and Frances. 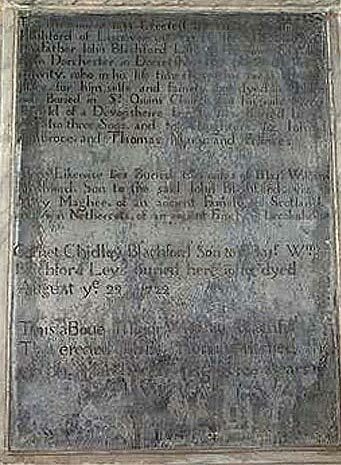 This memorial stone is in St Peter's Church, Templeport. St Peter's Church is part of the Parish of Templeport, Swanlinbar and Kinawley in the Kilmore Diocese of the Church of Ireland. Ambrose. and Thomas. Mary. and Frances. Mary Maghee. of an ancient Famely in Scotland. Cornet Chidley Blachford Son to Majr. Wm. This above Major William Blachford. 28th of March 1727 Aged 69 years. William Blachford was born Abt. 1638 the son of John Blachford. He died on 28 Mar 1727.